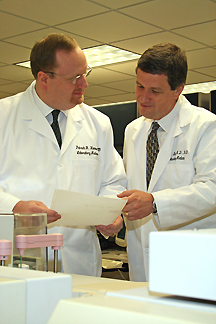 Welcome to Associated Pathologists, Ltd.
Associated Pathologists, Ltd. has a long tradition of providing high quality anatomic and clinical pathology services to the patients of Central and Southern Illinois. Based at HSHS St. John’s Hospital in Springfield, Illinois, our diagnostic pathology and laboratory services are supported by state of the art technology and instrumentation. Our goal is to provide outstanding diagnostic pathology and laboratory services as integral partners with HSHS St. John’s Hospital and the physicians in our community for the optimal care of every patient. © 2015. ASSOCIATED PATHOLOGISTS, LTD. ALL RIGHTS RESERVED.